Escape the urban bustle at Bodie State Historic Park and Panorama Trail. 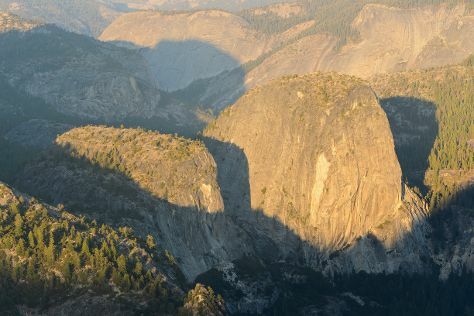 You'll explore the less-touristy side of things at Glacier Point and Olmsted Point. There's lots more to do: hike along Tuolumne Meadows, take in the dramatic natural features at Sentinel Dome, take in the dramatic scenery at Vernal Fall, and explore the striking landscape of Swinging Bridge Picnic Area Yosemite National Park CA. To find where to stay, ratings, photos, and more tourist information, go to the Yosemite National Park trip builder app . Sydney, Australia to Yosemite National Park is an approximately 19.5-hour combination of flight and car. You can also do a combination of flight, subway, bus, and taxi; or do a combination of flight, bus, and taxi. The time zone difference when traveling from Sydney to Yosemite National Park is minus 18 hours. In November, Yosemite National Park is colder than Sydney - with highs of 14°C and lows of -8°C. Finish your sightseeing early on the 3rd (Tue) so you can travel to Yellowstone National Park. Step off the beaten path and head to Grand Prismatic Spring and Lookout Point. 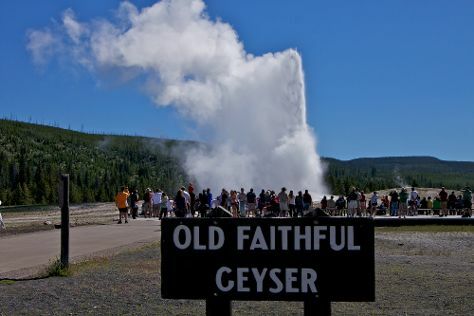 Step out of the city life by going to Old Faithful and Black Sand Basin. Spend the 6th (Fri) exploring nature at Yellowstone National Park. There's more to do: take in breathtaking views at Grand Canyon of the Yellowstone and explore the striking landscape at Lower Geyser Basin. To see other places to visit, photos, more things to do, and more tourist information, read our Yellowstone National Park trip tool . You can do a combination of car and flight from Yosemite National Park to Yellowstone National Park in 10 hours. Another option is to do a combination of bus, flight, and car. The time zone changes from Pacific Standard Time (PST) to Mountain Standard Time (MST), which is usually a 1 hour difference. Traveling from Yosemite National Park in November, expect nights in Yellowstone National Park to be a bit cooler, around -13°C, while days are much colder, around 0°C. Wrap up your sightseeing on the 6th (Fri) to allow time to travel to Custer. You'll explore and learn at Mammoth Site of Hot Springs and Adams House. Get a sense of the local culture at Mount Moriah Cemetery and Pioneer Museum. Venture out of the city with trips to Presidential Trail (in Keystone), Roughlock Falls State Nature Area (in Lead) and Insideout (in Hill City). There's lots more to do: immerse yourself in nature at Custer State Park, cruise along Wildlife Loop Road, explore the wealth of natural beauty at Mount Rushmore National Memorial, and explore the striking landscape at Needles Eye Tunnel. To see ratings, where to stay, more things to do, and tourist information, read Custer road trip app . You can do a combination of car, flight, and taxi from Yellowstone National Park to Custer in 7 hours. Other options are to drive; or do a combination of car and flight. Traveling from Yellowstone National Park in November, things will get somewhat warmer in Custer: highs are around 8°C and lows about -5°C. Finish up your sightseeing early on the 9th (Mon) so you can travel to New York City. Visit 9/11 Memorial and St. Patrick's Cathedral for their historical value. Let the collections at The Metropolitan Museum of Art and The Museum of Modern Art (MoMA) capture your imagination. Next up on the itinerary: take in the pleasant sights at Central Park, enjoy breathtaking views from Empire State Building, get a new perspective on nature at American Museum of Natural History, and make a trip to Times Square. To see where to stay, more things to do, maps, and tourist information, you can read our New York City tour itinerary builder . You can do a combination of taxi, flight, and bus from Custer to New York City in 8 hours. Alternatively, you can drive; or do a combination of bus and train. The time zone changes from Mountain Standard Time (MST) to Eastern Standard Time (EST), which is usually a 2 hour difference. While traveling from Custer, expect a bit warmer days and warmer nights in New York City, ranging from highs of 16°C to lows of 7°C. Finish your sightseeing early on the 12th (Thu) so you can travel to Branson. Start off your visit on the 13th (Fri): admire the natural beauty at Bonniebrook Park, head outdoors with Anglers Advantage, and then see the interesting displays at Titanic Museum. On the next day, stroll through White River Valley Trail, contemplate in the serene atmosphere at Thorncrown Chapel, and then see the interesting displays at Golden Pioneer Museum. To see more things to do, ratings, reviews, and tourist information, use the Branson trip planning tool . Getting from New York City to Branson by combination of flight and car takes about 8 hours. Other options: do a combination of bus, flight, and car; or drive. The time zone difference moving from Eastern Standard Time to Central Standard Time is minus 1 hour. Plan for slightly colder nights when traveling from New York City in November since evenings lows in Branson dip to 3°C. Wrap up your sightseeing on the 14th (Sat) to allow time to travel to Santa Fe. Do some cultural sightseeing at Loretto Chapel and Santa Fe Plaza. Museum-lovers will appreciate Georgia O'Keeffe Museum and San Miguel Chapel. Change things up with these side-trips from Santa Fe: Puye Cliff Dwellings (in Espanola) and Chimayo (Santo Nino Chapel & El Santuario de Chimayo). There's still lots to do: pause for some serene contemplation at The Cathedral Basilica of St. Francis of Assisi, get to know the fascinating history of Canyon Road, examine the collection at Museum of International Folk Art, and view the masterpieces at Tesuque Glass Works. To see traveler tips, other places to visit, reviews, and more tourist information, refer to the Santa Fe online travel route planner . You can fly from Branson to Santa Fe in 6 hours. Other options are to do a combination of flight and shuttle; or drive. Traveling from Branson to Santa Fe, you'll gain 1 hour due to the time zone difference. Expect a bit cooler evenings in Santa Fe when traveling from Branson in November, with lows around -1°C. Finish your sightseeing early on the 17th (Tue) so you can travel to Moab. Explore hidden gems such as River Rafting & Tubing and Adrenaline & Extreme Tours. Escape the urban bustle at Dead Horse Point State Park and Arches National Park. To find photos, reviews, and tourist information, read our Moab itinerary site . You can do a combination of flight and car from Santa Fe to Moab in 5.5 hours. Alternatively, you can drive; or fly. In November in Moab, expect temperatures between 15°C during the day and -1°C at night. Finish up your sightseeing early on the 20th (Fri) so you can go by car to Grand Canyon National Park. Explore hidden gems such as South Kaibab Trail and Mather Point. Take a break from the city and head to Rim Trail and Bright Angel Trail. There's more to do: take in breathtaking views at Grand Canyon South Rim and take some stellar pictures from Hopi Point. For maps, where to stay, reviews, and more tourist information, read Grand Canyon National Park road trip planning tool . Getting from Moab to Grand Canyon National Park by car takes about 5.5 hours. Traveling from Moab in November, expect a bit cooler with lows of -6°C in Grand Canyon National Park. Finish your sightseeing early on the 23rd (Mon) so you can drive to Sedona. Discover out-of-the-way places like Cathedral Rock and Wupatki National Monument. Your cultural itinerary includes sights like Walnut Canyon National Monument and Lowell Observatory. 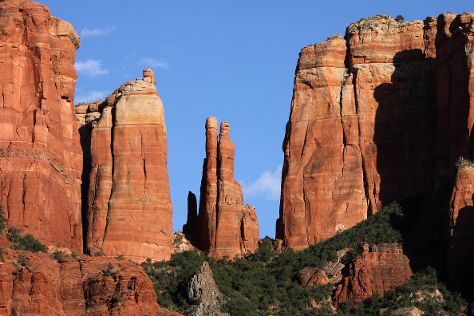 There's more to do: take in the dramatic natural features at Bell Rock and take in breathtaking views at Oak Creek Canyon. To see ratings, reviews, where to stay, and more tourist information, you can read our Sedona online travel planner . Getting from Grand Canyon National Park to Sedona by car takes about 2.5 hours. When traveling from Grand Canyon National Park in November, plan for somewhat warmer days and much warmer nights in Sedona: temperatures range from 20°C by day to 8°C at night. Cap off your sightseeing on the 26th (Thu) early enough to travel to Lahaina. Appreciate the collections at Kai Pua Artist Studio and Lahaina Galleries. Take a break from the city and head to Zipline and Stand-Up Paddleboarding. Change things up with a short trip to Scuba & Snorkeling in Kihei (about 40 minutes away). There's much more to do: get up close to creatures of the deep with a dolphin and whale watching tour, kick back and relax at Kahekili Beach Park, wander the streets of Lahaina Front Street, and make a trip to Lahaina Banyan Court. Plan my day in Lahaina using traveler tips and tourist information provided by Inspirock. Do a combination of taxi, flight, and bus from Sedona to Lahaina in 11.5 hours. Alternatively, you can do a combination of shuttle, flight, and bus; or do a combination of shuttle and flight. You'll gain 3 hours traveling from Sedona to Lahaina due to the time zone difference. When traveling from Sedona in November, plan for somewhat warmer days in Lahaina, with highs around 32°C, while nights are much warmer with lows around 25°C. Wrap up your sightseeing on the 29th (Sun) to allow time to travel to Honolulu. Get a sense of the local culture at Battleship Missouri Memorial and Makapuu Lighthouse Trail. USS Arizona Memorial and Iolani Palace will appeal to history buffs. Get out of town with these interesting Honolulu side-trips: Swim with Dolphins (in Waianae), Opana Radar Site (in Kawela Bay) and Shark Diving (in Haleiwa). And it doesn't end there: trek along Koko Crater Railway Trail, enjoy the sand and surf at Kailua Beach Park, explore the different monuments and memorials at National Memorial Cemetery of the Pacific, and see the interesting displays at USS Bowfin Submarine Museum & Park. For reviews, where to stay, photos, and more tourist information, refer to the Honolulu route app . Fly from Lahaina to Honolulu in 3.5 hours. Alternatively, you can do a combination of ferry and flight; or do a combination of bus and flight. In November, daytime highs in Honolulu are 34°C, while nighttime lows are 26°C. You'll have a few hours on the 5th (Sat) to wrap things up before traveling home.